A train conductor's life is pretty awesome. They get to hang out at front of the train, where they can see everything. They drive one of the fastest, heaviest, and distance enduring machines out there. Train engineers get to see all sorts of cities, rivers, and rolling hills. They drive the trains along hair-raising mountain cliffs and tunnels. Ever since the transcontinental railways was built, train engineers have been conductors of adventure. What kid hasn't wanted to be a train engineer? 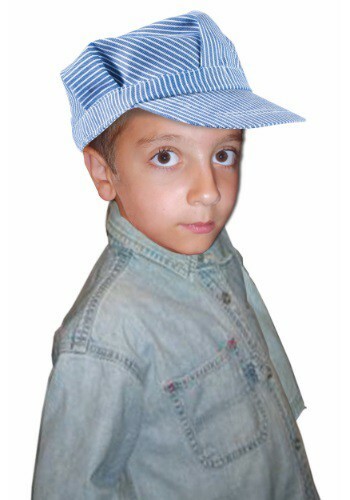 This classic striped engineer hat will inspire your child's imagination as soon as they put it on their head. They'll practically smell the coal smoke of those old fashioned steam engine trains. They'll almost hear the whistle of the train coming into town. As people line up at the depot to board, your child will look at the watch on the chain in their vest pocket and let out that iconic, "All aboard!" Who knows where your child will take their imaginary train.